New York City Triathlete - Thoughts and Conversations: Go Daddy! I am up in Lake Placid. The drive up was easy enough, although I fielded about a dozen work related calls while driving. Then when I got into my hotel room, I spent another hour on the phone handling some more work calls. It’s torture especially as I am trying to get my head onto Ironman. 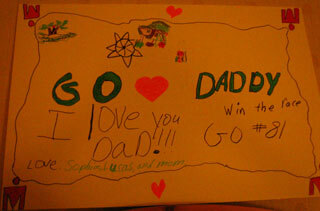 After I was finally able to hang up the phone, I hung up the sign that my children made for me to cheer me on. It hangs prominently in the room and you can’t miss it. It will be a constant reminder of my children while I am away. I also had them give me something of theirs I could wear during the race. My daughter gave me her red “People First” wristband and my son gave me a necklace he made in camp. I managed to get in an easy run around Mirror Lake with several pickups. I thought it was a 3 mile loop, but unless I ran sub-7 minute miles, it’s much less than 3. After, I donned my wetsuit and took a swim across the lake and back. I was a short swim, but it was getting late in the day and I was hungry. So was my father who was waiting for me to go to dinner. Tomorrow I will register and hopefully get in some more productive taper workouts.